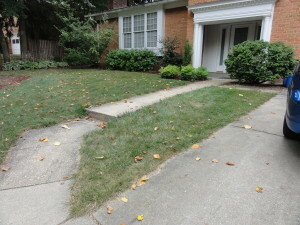 This area is a space that the homeowners see whenever they leave from or return to the house. It is the first area the visitor sees, and often is a very open area that casual passersby hone in on — in short, a focal point. There are challenges inherent in how to decorate such areas. They tend to be small. 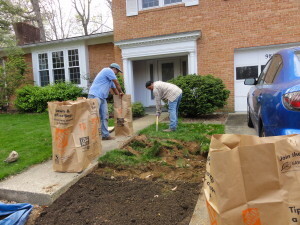 Typically, they are on the lower side of a front walkway, which defines the front foundation bed — a primary hot spot that was the first area to be developed and should not be hidden or overshadowed. 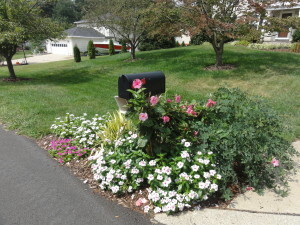 Other areas around driveways that benefit from garden decorating include at the base of the driveway (perhaps around the mailbox) or at the top of a driveway that does not reach the house. (1) Appropriate (usually small) scale. It is imperative in such a space that the mature size of each plant be taken into account. There is no room for sprawl. It is often more difficult to select plants for a small space than a large one because each plant (from the bulb to the small shrub) must be carefully selected to carry it’s weight appropriately. (2) Layering. These garden spaces are typically seen from various angles, so that the most comfortable design is often one that places taller items/anchors in the middle, and layers down to the edges. 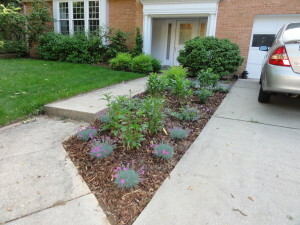 (3) Connect the garden bed style to the house architectural style. 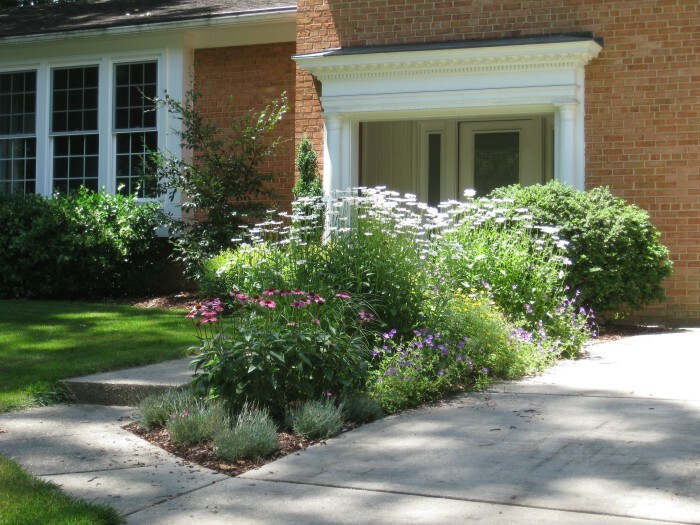 (A grouping of neatly clipped plants looks better with a formal Colonial style house.) More liberty can be taken in garden rooms or spaces off to the edge of the property. 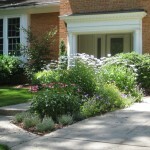 Driveway gardens should complement the front architecture of the house. (4) Year-round interest. The space could contain small evergreen shrubs. It might highlight colorful flowering bulbs and long-flowering perennials — and if that is the case, simply add some small ornamental grasses or evergreen edging that will provide interest in winter months while the flowers are dormant. 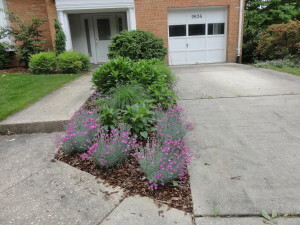 One of my favorite driveway gardens is a very small and challengingly irregular-shaped space on a Bethesda property, a space formerly filled with turf grass that was quite cumbersome to mow. The property is mostly heavily wooded, with plantings appropriate to that setting (deep shade, heavy — poor draining — clay soil). The spot in the front yard between the house and driveway is one of the only spaces on the property that enjoys a lot of sun and soil that drains well. The house style is contemporary split-level. 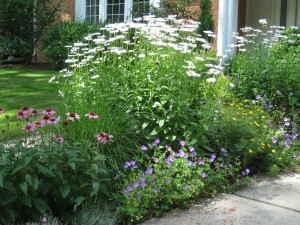 Therefore, the little garden could be designed to accommodate the homeowner’s yearning for a very colorful, lively perennial garden. 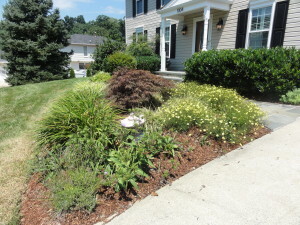 In the center area (top to bottom lengthwise), we placed some Leucanthemum x superbum ‘Becky’ (Shasta Daisy) to provide height, bordered top to bottom with a pair of Pennisetum alopecuroides ‘Hamln’ (dwarf fountain grasses that provide important year round interest). Note: the Shasta daisies spread, and we have subsequently cut off chunks to install in a nearby area that also has some sun, to provide continuity/repetition. The composite (‘daisy-like’) flower form of the Shasta daisy was the model for other selections. We placed Echinacea purpurea ‘Kim’s Knee High’ (Coneflower) in a space below the daisies. Kim was selected because it is shorter than the Becky daisy and provides nice structure on that secondary scale. We inserted some Coreopsis verticillata ‘Zagreb’ between the Echinacea, to repeat the composite flower type. Further up, alongside the Shasta daisies are some Geranium ‘Rozanne’, which spreads nicely to fill in empty spots on that ground plane. This is a nice edging plant, albeit sizable. On other edges, mostly at the corners, can be found Dianthus gratianopolitanus — we used the ‘Neon Star’ variety of these Cheddar Pinks because of its dark pink/magenta flowers that blend with the Echinacea and are the same tone of ‘hotness’ as the Coreopsis and Geranium flowers. The Dianthus was chosen because its powder blue grasslike foliage is evergreen, providing interest in the winter as well. In the upper corner closest to the house, stands a dwarf Nandina, which serves as an anchor. This was a transplant from the garden caty-corner to the new one that contained several Nandina and could easily spare one to situate in the new bed, providing the connection between those two spaces. This small palate of plants was carefully selected to provide a variety of textures and heights. 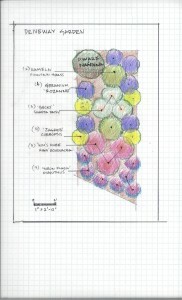 A simple pastel color scheme (not too busy) includes pink/purple, yellow and white inflorescenses. 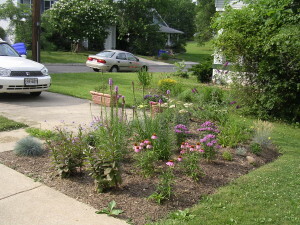 All plants share the same cultural needs (full sun and well-draining soil). 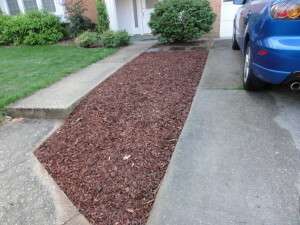 They tolerate dry conditions and the adjacent hot concrete and car exhaust. Hence, an awkward bland-looking space was easily transformed into a vibrant colorful area that provides interest in all seasons and offers great curb appeal for this home.